UPDATED: The U.S. Department of Justice has rejected Texas' application for preclearance of its voter ID law, saying the state did not prove that the measure would not have a discriminatory effect on minority voters. The Texas NAACP and the Mexican American Legislative Caucus filed a motion to intervene in the state’s lawsuit against the federal government that seeks immediate implementation of the state’s voter ID law. During a conference call this afternoon with reporters, attorneys for the groups said the lawsuit will move forward independently, despite today’s decision by the Department of Justice. The U.S. Department of Justice has rejected Texas' application for preclearance of its voter ID law, saying the state did not prove that the bill would not have a discriminatory effect on minority voters. “As noted above, an applicant for an election identification certificate will have to travel to a driver’s license office. This raises three discrete issues. First, according to the most recent American Community Survey three-year estimates, 7.3 percent of Hispanic or Latino households do not have an available vehicle, as compared with only 3.8 percent of non-Hispanic white households that lack an available vehicle. Statistically significant correlations exist between the Hispanic voting-age population percentage of a county, and the percentage of occupied housing units without a vehicle. The bill, Senate Bill 14 by Sen. Troy Fraser, R-Horseshoe Bay, was one of Gov. Rick Perry’s “emergency items” during the 82nd Legislature and requires voters to present a state-issued photo ID, such as a driver’s license, military ID, U.S. passport or concealed handgun license before casting a ballot. Texas Attorney General Greg Abbott, who expected the federal government's rejection, said late last week he plans to forge ahead with the lawsuit he filed last month to have the bill implemented immediately. The Justice Department has until April 9 to respond to the lawsuit. Abbott has cited the department’s rejections of recently passed laws similar to Texas’ voter ID law, not to mention that less-than-subtle warning from U.S. Attorney General Eric Holder, who said in Austin in December that the department would place Texas’ law under a microscope. “It [the request] was submitted to them in July, and they kept delaying and delaying and delaying," Abbot said on Thursday. “We saw them reject a similar proposal in South Carolina and we couldn’t see them rejecting South Carolina and approving Texas." March 23, 2011: SB 14 passes the Texas House of Representatives following debate on more than 60 amendments and seven points of order. The House discussed the bill for about 12 hours. May 9, 2011: The Texas Senate adopts the voter ID conference committee report, which tweaked some of the amendments approved during the House floor debate. May 16, 2011: The Texas House approves the committee’s report, which removed a provision that would have allowed residences of federally recognized tribal lands to show their tribal IDs to vote. The bill’s House sponsor, Patricia Harless, R-Spring, also introduced an “outside the bounds resolution” that included in the bill a provision in which free IDs would be made available for the sole purpose of casting a ballot. A provision to exclude people who attest under oath they do not have their photos takes due to religious purposes was also adopted. July 2011: The Texas Secretary of State’s office submits to the U.S. Department of Justice the required request for preclearance. Because of Texas' history of racial discrimination, Section 5 of the federal Voting Rights Act gives the U.S. Department of Justice or the federal courts the authority to review laws that would affect voter participation. Fifteen other states are subject to the preclearance rule. August 2011: The National Conference of State Legislators issues a report explaining the differences in Texas’ law compared to others recently passed. The report concludes that only six other states, like Texas, have a strict photo requirement: Georgia, Indiana, Kansas, Wisconsin, South Carolina and Tennessee. Seven states — Alabama, Florida, Hawaii, Idaho, Louisiana, Michigan and South Dakota — ask voters for photo ID, but still allow them to cast a ballot if they don't have a photo ID and can meet other specific criteria. Sixteen other states require voters to show some form of ID, though not necessarily with a photo. “The law puts Texas in the group with Indiana and Georgia, which I would categorize as fairly strict,” Doug Chapin, an elections expert at the University of Minnesota's Humphrey School of Public Affairs, told the Tribune. September 2011: Arguing the bill unfairly affects minorities and the elderly, a coalition of civil and rights groups writes the Department of Justice urging denial of the preclearance request. In a letter submitted during the public comment period by the Advancement Project, the American Civil Liberties Union, the Asian American Justice Center and the Southwest Workers Union, the groups allege that instead of actually providing proof the legislation was enacted for non-discriminatory reasons, the state relied simply on its claim that officials did not intend on diluting the voting strength of minority groups. Sept. 23, 2011 The DOJ tells the Texas Secretary of State’s office that it needs more information to render a decision on whether SB 14 will “have neither the purpose nor will have the effect of denying or abridging the right to vote on account of race, color, or membership in a language minority group." Specifically, it wants to know details about the estimated 605,600 registered voters who do not currently possess a valid ID. The department asked the state to identify how many members of that group have Spanish surnames, which counties they reside in and an estimated number by race. The DOJ also requested that the state provide the number of registered voters in Texas with a Spanish surname who currently possess a legal form of identification. Oct. 5, 2011: The state responds and says it does not ask about voters' race when they register. Instead, the Texas Secretary of State submitted a list of all the Hispanic surnames in Texas, according to the U.S. Census Bureau. The state also offered to run that list against the list of registered voters to determine how many have Hispanic names, and it offered to use data from the Texas Department of Public Safety, which issues driver's licenses, to assist in obtaining the information. Dec. 13, 2011: U.S. Attorney General Eric Holder tells an audience at the LBJ Library at the University of Texas at Austin that the federal government will fight to ensure minority voting rights are not eroded by actions of state legislatures. He says the Texas bill will undergo a fair and thorough review. December 2011: The American Civil Liberties Union files a suit in federal court challenging the state of Wisconsin’s voter ID law. ACLU attorneys allege that bill is less strict that the Texas proposal but will also disenfranchise minority and elderly voters. Nonetheless, a decision on the Wisconsin bill could be used as a guide to determine what other states can and cannot do. “This lawsuit is the opening act in what will be a long struggle to undo the damage done to the right to vote by strict photo ID laws and other voter suppression measures,” Jon Sherman, an attorney with the ACLU Voting Rights Project, said in a statement. “Across the nation, legislators are robbing countless American citizens of their fundamental right to vote, and in the process, undermining the very legitimacy of our democracy. 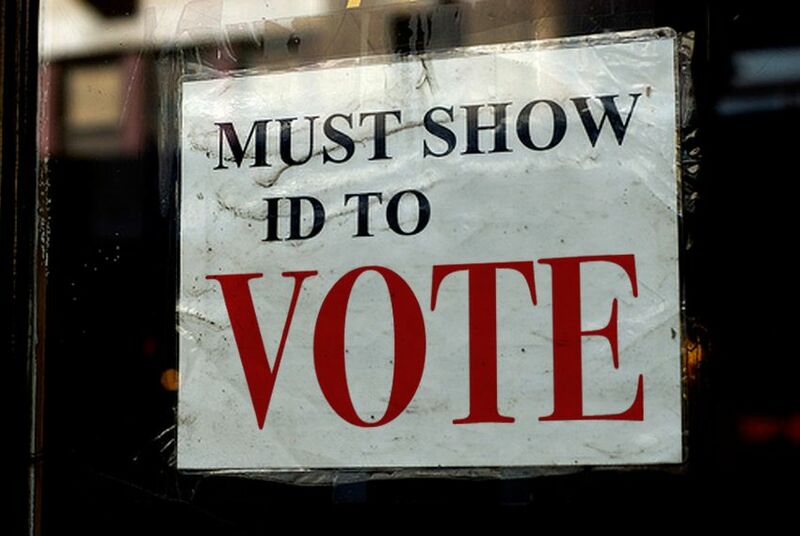 Dec. 23, 2011: The Department of Justice issues a ruling rejecting South Carolina’s voter ID law. Jan. 13, 2011: The state of Texas resubmits its request for preclearance, and the Department of Justice has 60 says from this state to make a decision. Again, the state warns about the reliability of the data. Jan. 23, 2012: Texas Attorney General Greg Abbott files suit against the U.S Department of Justice in an attempt to have the state’s voter ID law implemented immediately. Abbott says his office will drop the suit if preclearance is granted. March 7, 2012: The Texas Secretary of State tells the Tribune the state will be ready to have the required outreach and voter-education requirements in place by the May 29 primary if the preclearance request is granted. “As I understand it, they have three options: They can issue preclearance, they can deny preclearance or they can request more information,” said Rich Parsons, a spokesman for the secretary of state. April 9, 2012: The Justice Department’s deadline to respond to the state’s lawsuit.